Immune response. 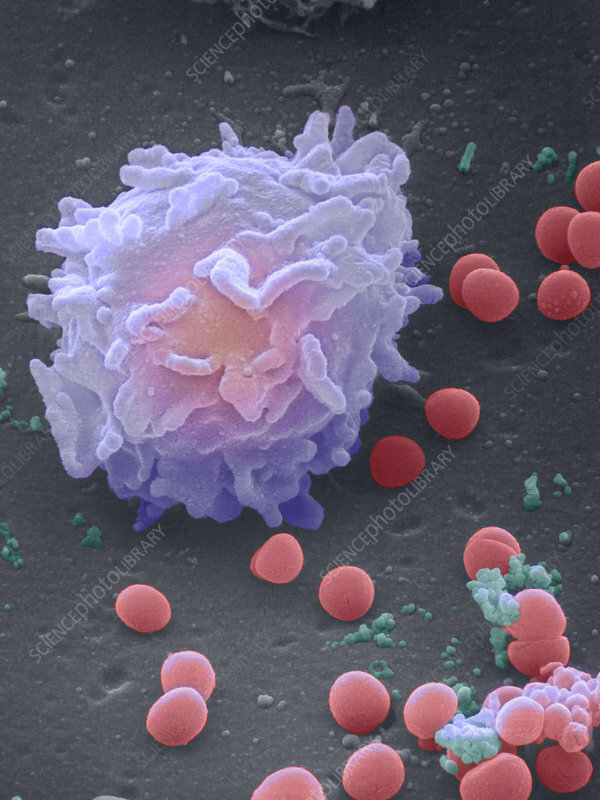 Coloured scanning electron micrograph (SEM) of a leucocyte (white blood cell) surrounded by Staphylococcus aureus bacteria. The leucocyte (mauve) is part of the body's immune response against the presence of the bacteria (red). There are several types of white blood cell in the body, each with a specific function. Some are attracted to bacteria and engulf and destroy them. Some release antibodies to kill the cells, some bind to them directly, and some are responsible for mediating the entire response. Staphylococcus bacteria can cause boils and food poisoning. Magnification: x5,500 at 5x7cm size.